While the space program unravels mysteries of the universe, it also reveals valuable insights about Earth. 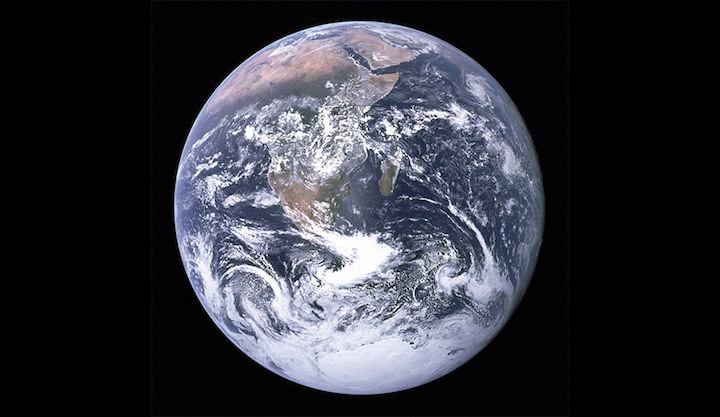 The perspective available from NASA satellites provides a scientific understanding of Earth's interconnected systems and the planet’s response to natural and human-induced changes. The first two decades of the Space Age focused on developing the capabilities of Earth-observing satellites. In the 1980s, NASA began a comprehensive study of our planet as an integrated system. Long-term global observations of the land surface, biosphere, solid Earth, atmosphere, and oceans are improving scientists’ ability to predict climate, weather, and natural hazards. As a research and development organization, NASA has been sharing its new technologies and Earth application programs with other agencies and the private sector. View of the Earth as seen by the Apollo 17 crew -- astronaut Eugene A. Cernan, commander; astronaut Ronald E. Evans, command module pilot; and scientist-astronaut Harrison H. Schmitt, lunar module pilot -- traveling toward the moon. 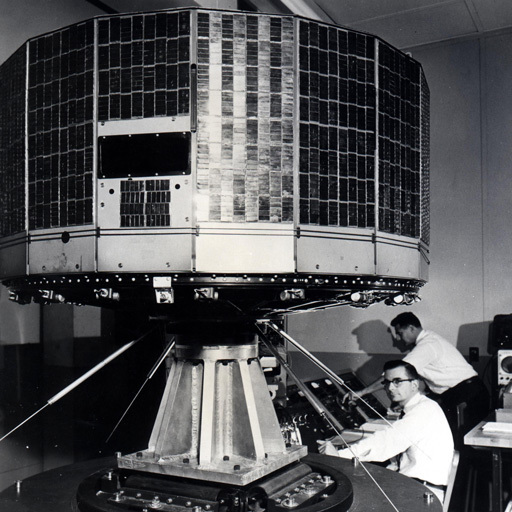 On April 1, 1960, NASA launched TIROS 1, the nation’s first weather satellite. It operated for only 78 days but demonstrated the feasibility of monitoring Earth's cloud cover and weather patterns from space. This NASA program provided the first accurate weather forecasts based on data gathered from space. Nimbus, Latin for “rain cloud,” revolutionized how we study Earth’s weather systems, environment, and atmosphere. 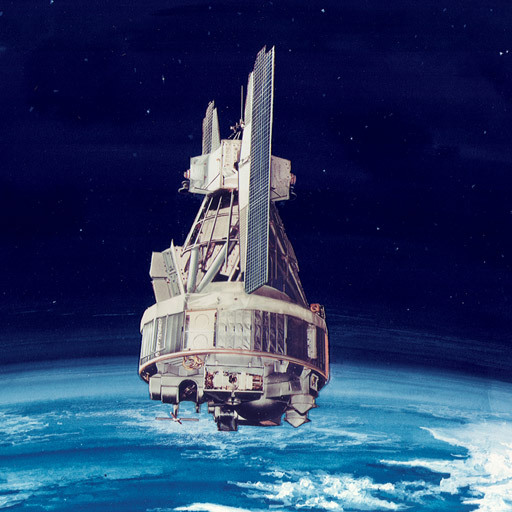 First launched in 1964, seven Nimbus satellites provided Earth observations for 30 years. Nimbus satellites gave us the first images of hurricanes from space, and their data contributed to improved long-term weather forecasts, demonstrated search-and-rescue technology, and provided some of the first consistent global measurements of oceanic plant life and the ozone layer. 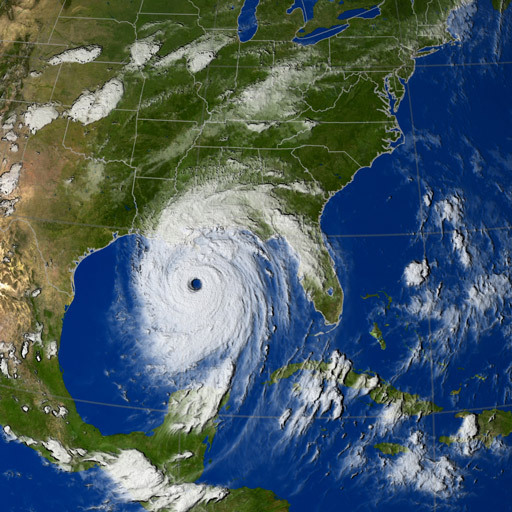 Hurricane Katrina seen by a GOES satellite on Aug. 29, 2005. Much of our knowledge of weather has been derived from two long-running series of weather satellites that NASA has built and launched for the National Oceanic and Atmospheric Administration. Dubbed GOES and POES, the more than 30 satellites have been observing Earth since 1970, with continual improvement in their capabilities, some of which are transitioning into a new generation of weather satellites. NASA’s Earth resource satellite program began in 1972 with the launch of Landsat 1, the first in a series that continues with Landsat 8, launched in 2013, and will be further enhanced with the anticipated launch of Landsat 9 in 2020. Now conducted jointly by NASA and the U.S. Geological Survey (USGS), Landsat plays a critical role in monitoring, understanding, and managing resources needed for human survival, such as food, water, and forests. 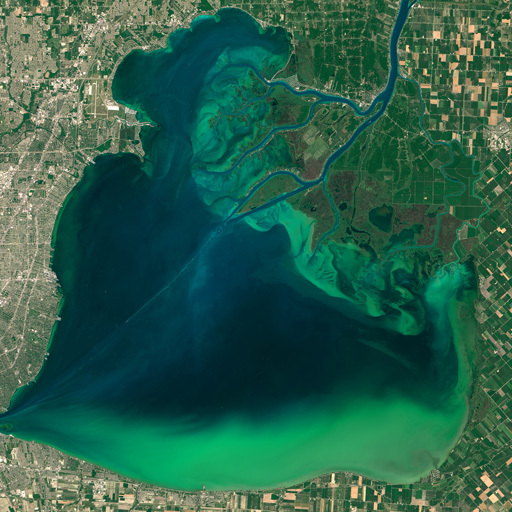 Algae bloom, visible as swirls of green, in Lake St. Clair, part of the Great Lakes system. Image captured from the Landsat 8 satellite, July 28, 2015. 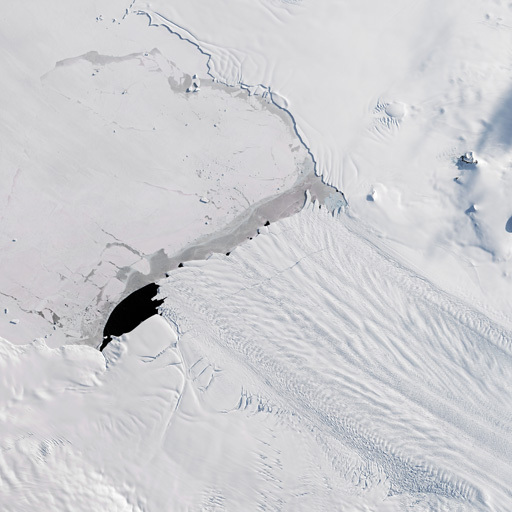 A new iceberg calved from Pine Island Glacier, one of the main outlets where ice from the interior of the West Antarctic Ice Sheet flows into the ocean. The Landsat 8 satellite captured this image on Sept. 21, 2017, just before the break. 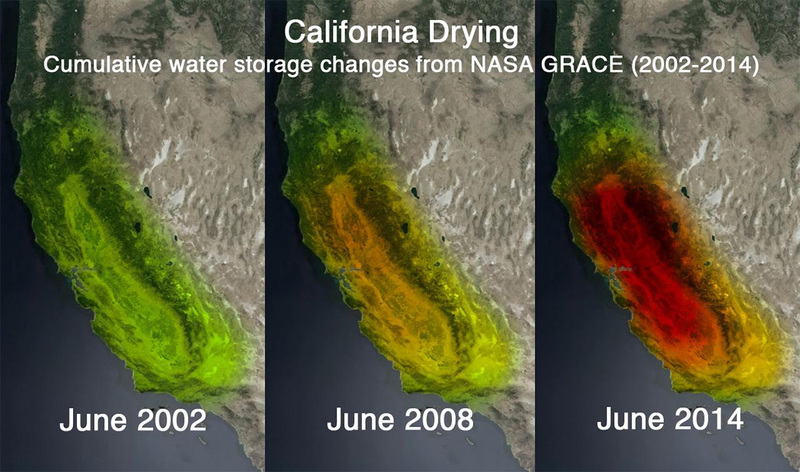 This trio of images depicts GRACE satellite observations of declining water storage in California over a 12-year period. Colors progressing from green to orange to red represent greater accumulated water loss. Are the ice sheets that still blanket the Earth’s poles growing or shrinking? Will global sea level rise or fall? The primary goal of ICESat, launched in 2003, was to quantify ice sheet mass balance and understand how changes in the Earth’s atmosphere and climate affect polar ice masses and global sea level. ICESat-2 will launch in 2018. 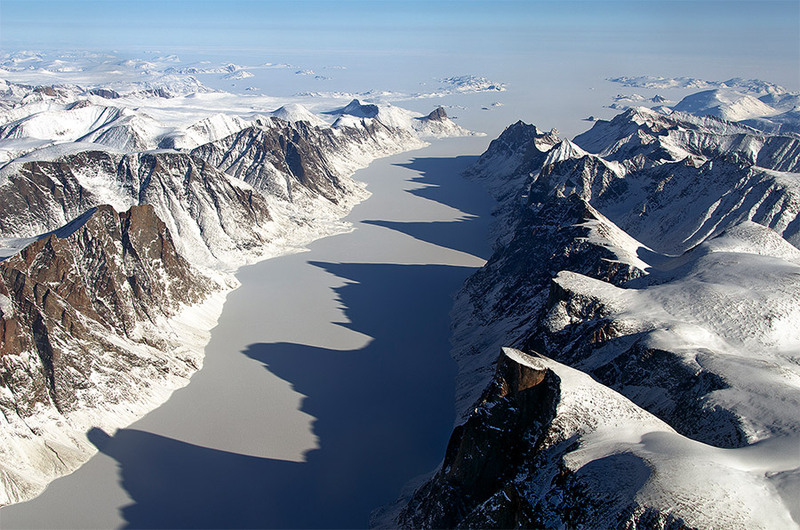 ICESAT will monitor changes in Earth’s glaciers and ice sheets. The Earth’s climate has changed throughout history, but NASA research has been important in determining that humans are causing the warming we are seeing now (about 2 degrees Fahrenheit since the late 19th century). 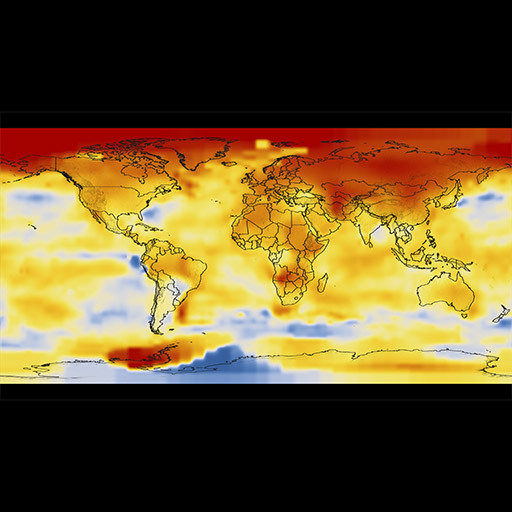 Data from the Earth Observing System and other satellites will be able to monitor changes in the Earth’s system to better understand the pace of climate change and its effects. 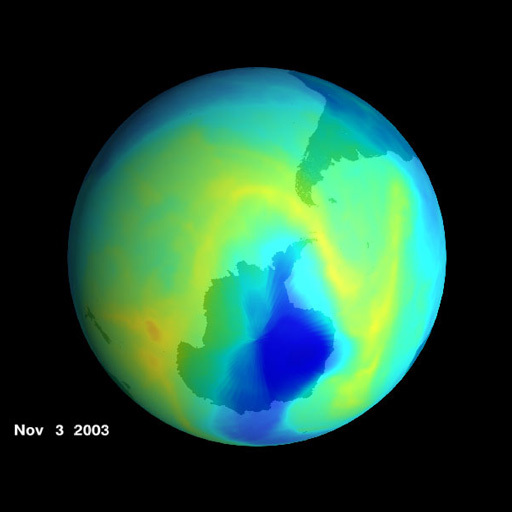 In 1985, scientists discovered that ozone – a gas that high in Earth’s atmosphere that blocks the Sun’s ultraviolet rays – became severely depleted over their Antarctic observation posts each winter. NASA satellite data confirmed the depletion was occurring continent-wide in what came to b known as the Antarctic ozone hole. It soon became clear that humans were causing the depletions, and in the 1990s, nations agreed to restrict the use of the chemicals that caused it. Early in 2018, NASA data showed the ban was working, and ozone levels were recovering. Studying how Earth’s systems interact is as important as studying the individual systems. 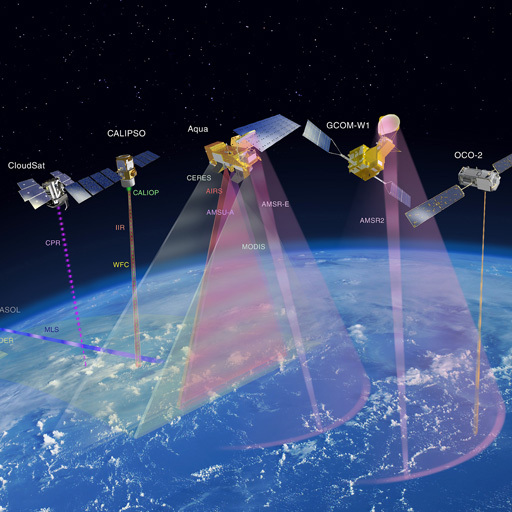 NASA and its international partners operate several Earth-observing satellites, collectively called the A-Train, that closely follow one after another along the same orbital track. The near-simultaneous observations of a wide variety of factors help the scientific community advance our knowledge of Earth-system science and apply this knowledge for the benefit of society. Each satellite of the A-Train has its own mission. For example, Aura’s instruments study the atmosphere’s chemistry and dynamics. Orbiting Carbon Observatory 2 (OCO-2) measures atmospheric carbon dioxide, an important greenhouse gas. 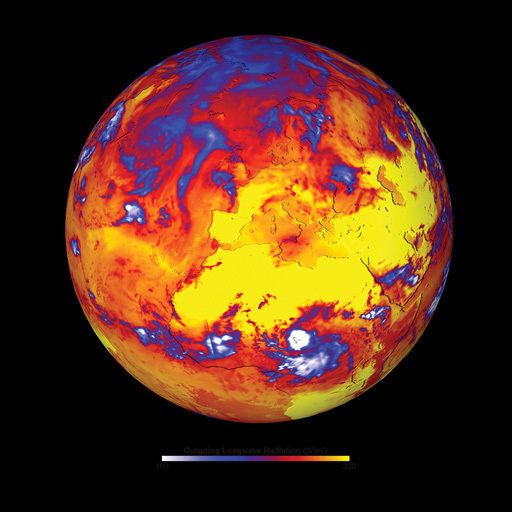 This globe shows outgoing longwave (infrared) radiation emitted by Earth and atmosphere during the European heat wave of 2003. Data from the A-Train’s Aqua, CALIPSO and CloudSat satellites contributed to the image. 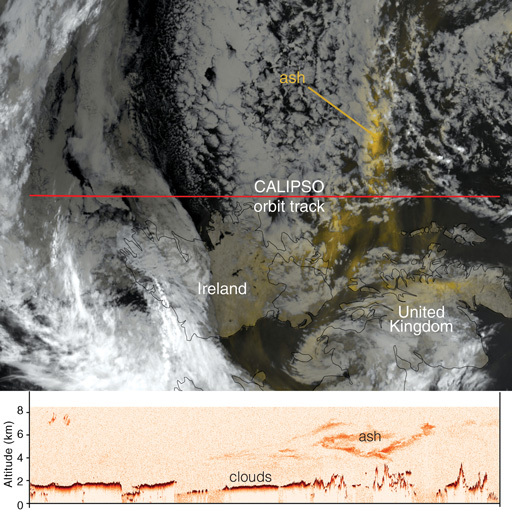 Image from A-Train’s CALIPSO/CALIOP shows the spread of an ash plume from Iceland’s Eyjafjallajökull volcano, six days after erupting on May 10, 2010. The International Space Station, a unique science laboratory for many different fields of research, has a range of instruments that support Earth science investigations. These tools are generating information that is helping scientists understand and address global environmental concerns. The data and images are particularly useful for helping developing countries facing weather and resource related challenges. 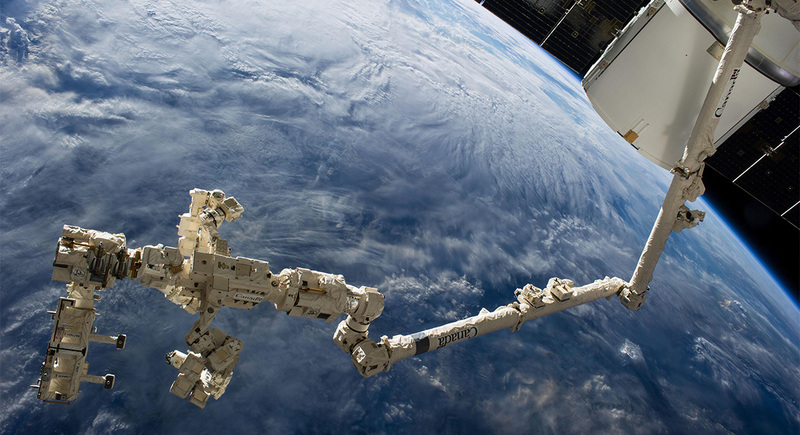 Dextre, the space station’s robotic arm, carrying the RapidScat instrument assembly. RapidScat, was a radar instrument that measured wind speed and direction over the ocean, and was useful for weather forecasting, hurricane monitoring, and observations of large-scale climate phenomena such as El Niño.